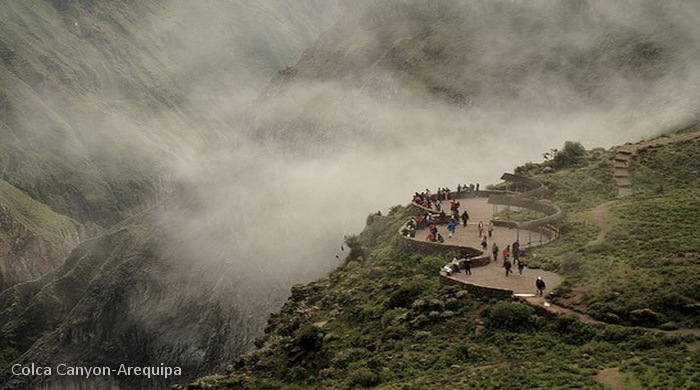 The Colca Canyon is located in the northeastern region of Arequipa,165 kilometers from the city of Arequipa and Chivay 40 km from main town and capital of the province of Caylloma. It is more than twice as deep as the Grand Canyon in the United States 4,160 m.
Throughout the region, you can see colorful pre-Incan agricultural terraces still used today for growing quinoa, corn, barley, and wheat. During the pre-Hispanic era, the department was inhabited by the Collaguas and the Cabanas; today, the inhabitants have learned to conserve their Colonial churches in Yanque, Lari, and Madrigal, and they continue to wear their traditional clothing. Colca Canyon is home to animals such as the Andean condor among other 100 species of birds, four types of camelids: vicuna, guanaco, llama and alpaca. In addition there are over 300 species of plants, of which 30 are cactus, not to mention the original green yareta. At 02:00 a.m. we lleave Arequipa driving for 3 and a half hours towards Chivay; The capital of the Colca Canyon on north west direcction behind snow-covered Chachani. Breakfast. Then we continue driving for 2 more hrs towards the most visited point “ the Cross of the Condor” here we are able to see the depth of the canyon and the flight of the Condor. The area presents beautiful tipical towns, like Yanque & Maca, colonial churches, gently people with tipical needlework dresses, hundreds of pre inca terraces still in use with andean growings like corn, quinua, kiwicha among others. After Lunch we come back to Arequipa; on the way we stop at the highest pass: the view point of the Volcanoes and snow covered mountains in Patapampa (4,800 m. - 15,000 ft.). Later we will see wild vicuñas, alpacas & llamas in Pampa Cañahuas national reserve, some birds like flamingoes, ibis, andean gooze, ducks, andean eagle "Kara Kara". ( 18:00 hrs. approx. Back in Arequipa).